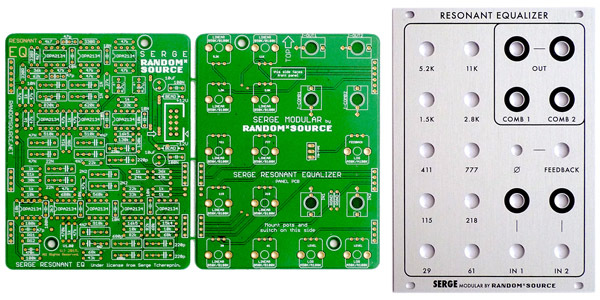 when the Serge VCFQ filter was released a few weeks ago, some of you requested a slim version of the Resonant EQ - which I thought was a great idea! 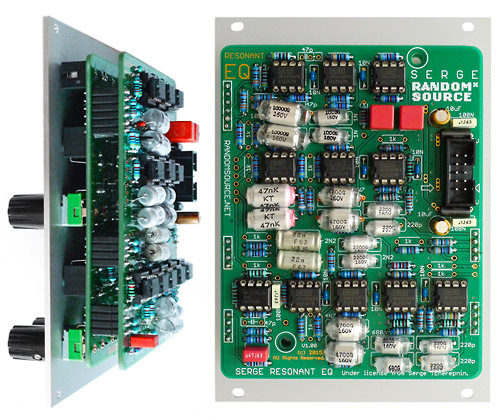 So here's the Random*Source adaption of the amazing Serge Resonant Equalizer (EQ) in Euro format - under license and with the kind support from Serge. The R*S version adds an input mixer with 2 inputs that can be built/used to attenuate or amplify/distort the input signal(s) before they are sent into the EQ and a Feedback section (knob and phase switch) which allows to feed back the output signal or the inverted output signal (depending on the Phase switch). Adding inverted feedback leads to interesting phase cancellation/filter effects - unlike the “normal” feedback, level decreases and the signal thins out. Currently the Euro version is available as a front panel (screen printed, 18hp) + pcbs kit. Module depth is < 40mm (~1.5"). 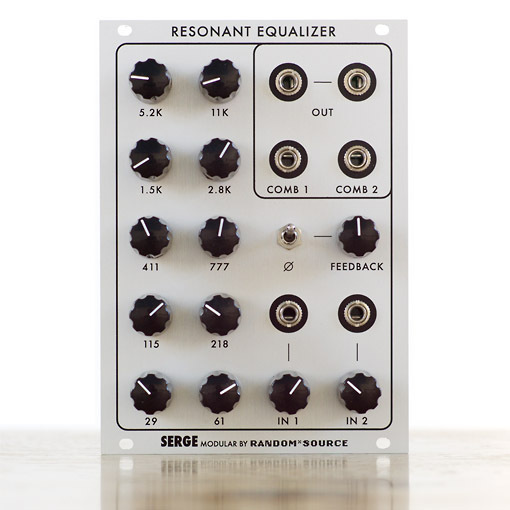 See the R*S Resonant EQ page for more info - that's also the order page. Kits are shipping now - as long as stock lasts. Hope there'll be more batches, great work RS! Fantastic - this one is a definite buy, i've never liked the slider version. looks very nice! Is there any chance to get the individual outs from this? Only one way to get better at it. With all that polystyrene I might order from Rush-on-line once again. Ive got a lot of revision to do for exams, however if i have a few hours spare tomorrow ill make a mouser car and post it here. Simply because i was going to use Rapid however having a quick look they don't have Burr Browns and theres a few capacitor values i can't find either so i'll reluctantly use Mouser instead. Well... I expect that those 1k resistors that you can omit connect to the individual outputs (they connect to ten unused holes on the pcb). My Serge panels are getting nervous. If the TWS and WVX come out there might be some upheaval. yes!! ordered. very happy to see a compact but not crammed version of this in Euro. any hints of what might be coming next? Actually, this would be fantastic to know. There is no way I can fit these into my main case, but if some more bits are coming I might just go ahead and revive my little second case just for this line of modules. I expect it's a DUSG. Amazing! I'm probably going to sell my wide Res EQ mk. 2 as I don't really need the individual outs. However, I'm totally going to wait for the Thonk kit this time around. Sourcing the caps and resistors last time was a decently time consuming process. Congrats on the awesome work on all of these. Removing the wiring pre-requisite really opens up these designs to builders with less time on their hands. Plus, the panel designs are absolutely gorgeous. If it is I will be in heaven! any chance of a breakout panel for that in the future? if you see anything fishy let me know!